One of our fondest memories of living in Tokyo seven years ago is of riding our bikes around daily. Living within riding distance of Harajuku, Shinjuku, Shibuya and even Koenji and Shimo-Kitazawa meant we used our bikes as our main form or transportation, even riding home at 4am a little worse for wear after a night at Trump Room in Shibuya. Somehow we just never got into that habit since moving back to Australia - not sure why that is really, I even owned a great second hand bike for a while but just never rode it so we sold it before the move to Sydney. Now that we're back in Melbourne and no longer living in the CBD - where we never really feel safe riding on the busy roads, we thought it was time to get back in the saddle so to speak. We're currently in Fitzroy which is ideal for bike riding, the back streets are safe and mostly car free - just like where we would ride in Tokyo. I loved my red Japanese mamachari so much, for $90 new it really was a great bike. 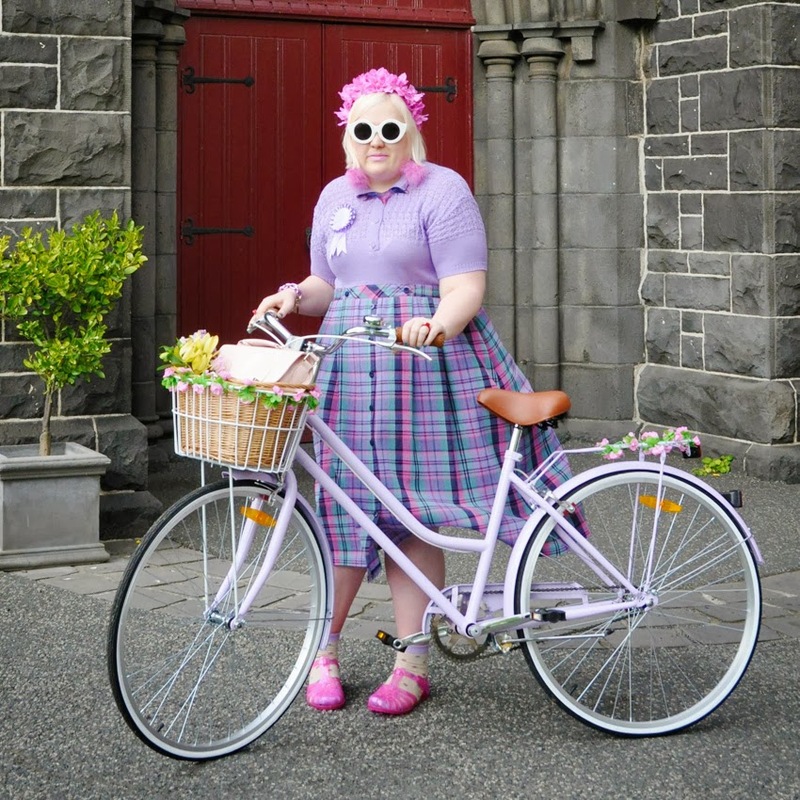 You can't really get a bike that cheap in Australia so when I saw Reid Cycles vintage styled ladies bike for $235 I knew that was the bike for me, especially as it came in so (read too) many pretty colours to choose from. I eventually went with the cute pastel lavender as in person the pink was a bit too metallic for me. Henry found his bike on Gumtree (our version of Craigslist) and yesterday we went on our first ride together and had so much fun. We rode to East Brunswick and had brunch at Small Block, and checked out some cute boutiques I've been meaning to visit forever - Monk House Design and Kuwaii who were having a cute little wedding ideas event (check out my instagrams from the day) and then rode on to Brunswick Savers where I actually picked up the cute lavender top and skirt I'm wearing in this outfit. We stopped and had well deserved ciders at a local pub and then had rode home through Carlton stopping for dinner along the way. Talk about an epic first ride but oh what fun we had. So happy to be back in the bike lane. Going to an op shop (thrift store, charity shop etc) with a set idea of what you want to find is never a good plan, but it so worked for me this time. I went in to Savers hoping to find some cute pastel purple pieces and voilà I found exactly what I was looking for. The op shops gods were certainly looking out for me because that has never happened to me before. At the Kuwaii event guests were all given these cute bouquets by local florist Cecilia Fox that were just made for propping in my bicycles basket - super chic. 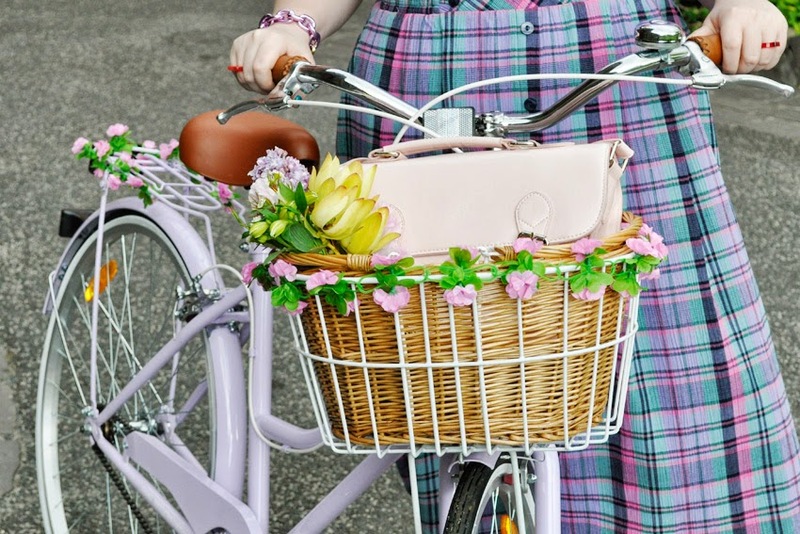 I decorated my bike with some faux flowers from my local $2 shop just for some extra cute factor. So happy to finally own my dream sunglasses thanks to an early Christmas present from my mum. 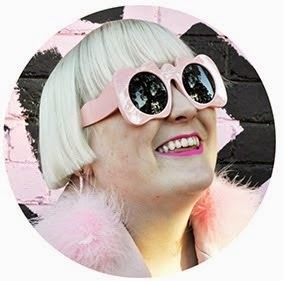 I've been lusting after these Tsumori Chisato cat eye sunnies from Pet Shop Girls since I first tried them on in March, every outfit I've put on since then I've been thinking "if only I had those sunglasses to top it all off". Also a lovely reader saw that I wanted a pair of Poms fluffy pom pom earrings but don't have my ears pierced so she made me a pair of clip-on earrings and sent them to me. So lovely. 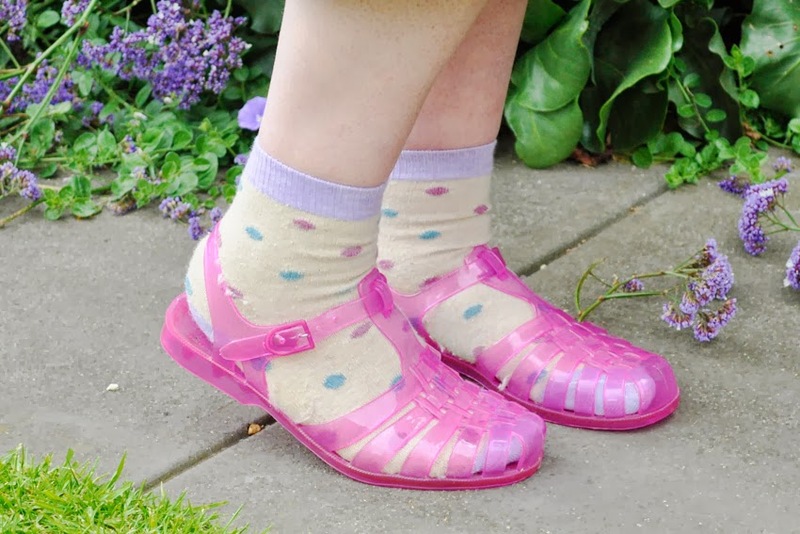 Now that the cold cold days of winter are behind us I can finally rock my fave socks + sandals combo once more. omg i dont know where to start! this outfit is just stunning and with the bike it rounds everything off! im loving the colors! 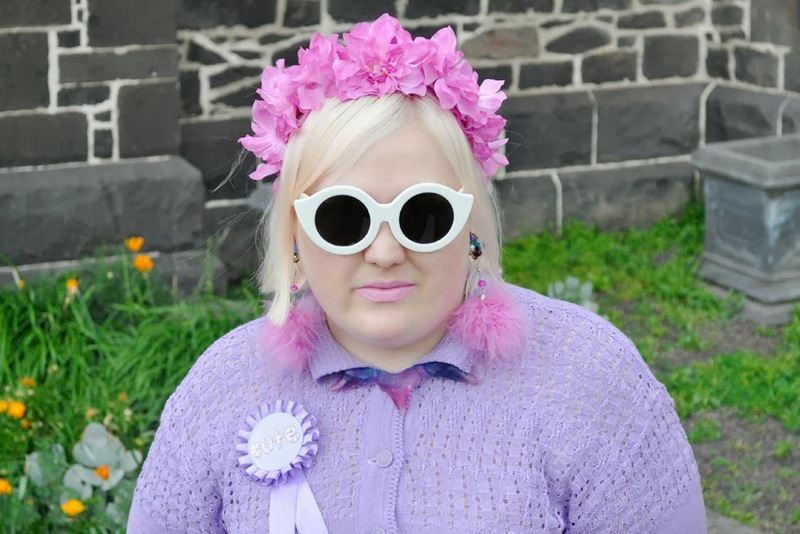 Lavender is my favourite colour! & teamed with pink is so lovely! If I was a bike rider I think I'd defiantly need one like this. love it! Sigh sigh! I saw this outfit on Instagram and fell in love! I really really think this is one of my favorite outfits of yours! 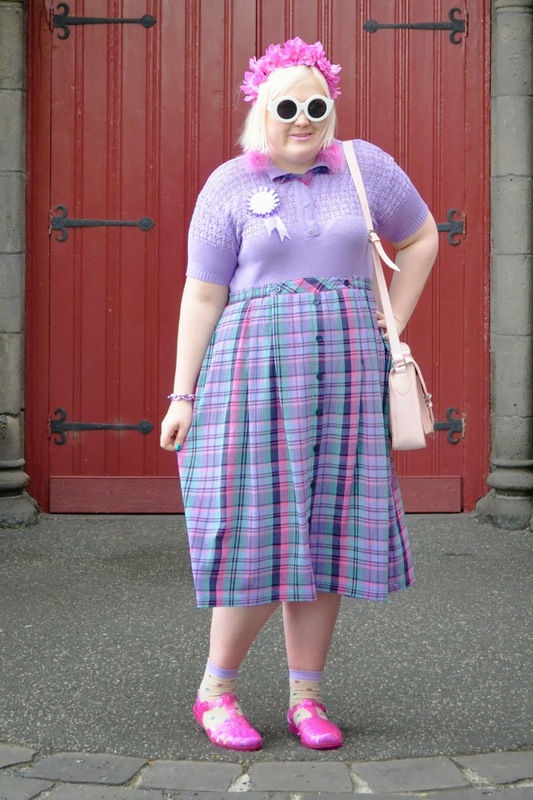 I love the whole lavender theme, and while this isn't as bright as your usual outfit I think it's still very kitsch and very you! :) Too cute! O I miss riding my bike since feb! can't wait to get back onto my pistachio and white cruiser. P.s love all the pastel lavender. Those sunglasses are out of this world spectacular. Again I bow down in awe of your bold and brave outfit choice. And gawwwd looord do I miss Melbourne right now!!!! There is just so many things to compliment when it comes to this outfit but i just love love LOVE the fluffy earrings! What an amazing gift; you clearly have fabulous readers! This outfit = perfection! It's like the fashion Gods were smiling on you when you found those items in Savers! I'm also super in love with your bike! Fantastic as always, your skirt is super cute! !